Our staff have limited experience of developing the curriculum, something which we teachers and others living in Europe, USA and Australia understand and take for granted. Our staff have been enthusiastic participants in workshops and visits from people with different expertise. 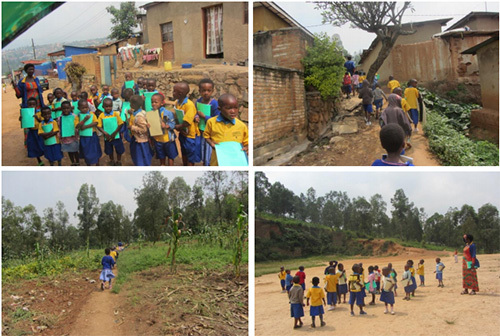 Some of the things they have taken further themselves as they have been personally inspired and so the next two newsletters will concentrate on how we have progressed from those first days when the teachers told me the children had to sit at desks and copy from the blackboard to learn. With the help of many colleagues and friends over the years I have worked with the teachers and assistants to increase their understanding of how an enriched curriculum increases understanding and curiosity in the learning process. They now understand the importance of first-hand experience though opportunities are few and far between. There are no designated parks or play areas in Kigali. There are some gardens, always behind locked gates or where the general public is forbidden to walk. There are very few places which the children can visit, no public sports fields or gardens. Play is not on the agenda. 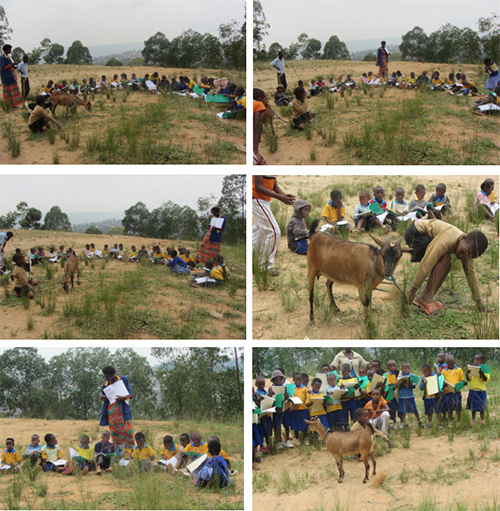 This news is a photo essay of the Nursery 2B children visiting a goat in the area behind the school. There is a section in the basic workbooks the children use throughout the year which has a section on animals. Goats are to be seen everywhere but seldom has one been studied quite so intensely! The children enjoyed their visit, learning to look and take notice, to be curious and ask questions. A good day. Setting off to the area behind our building, currently planted with beans and other foodstuffs by local people including many of our families – designated for commercial development in the future. Meeting the goats, drawing them, asking questions, talking to the boys who are minding them. Small but significant steps. We are getting there, out and about, learning to look more closely at our environment. With grateful thanks to recent friends on colleagues who have helped us in this process, we are so grateful. Wishing you love, peace and good health in your lives, wherever you are.